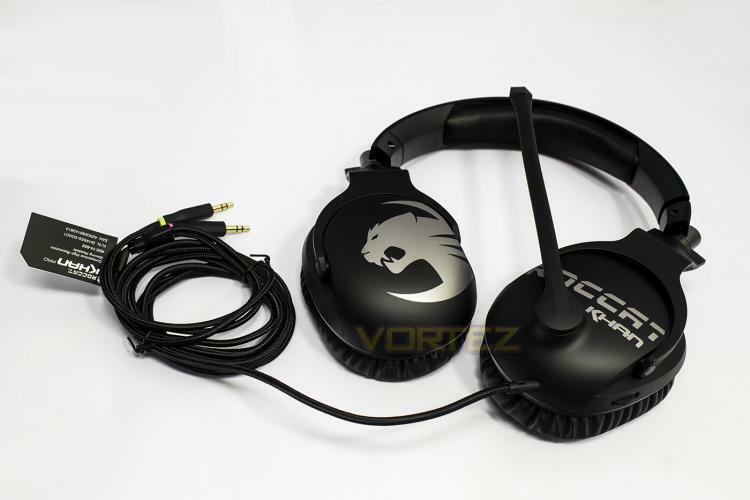 ROCCAT are back, this time we are looking at a lightweight gaming headset, the Khan Pro, which comes in at just 230g. It has been designed in a way to remain robust despite its mass, and features ergonomically positioned ear-cups that will naturally fit the line of your ears, when combined with some memory foam cushioning, we can expect long lasting comfort. Despite being lightweight, the Khan Pro has been made with high quality materials to ensure that it is robust, and the long braided cable goes without an in-line remote, instead moving the volume dial onto the left ear-cup, and the microphone boom will automatically mute when raised. Inside the Khan Pro, you will find high-speed 50mm drivers that have a frequency response of 10Hz - 40KHz, entitling it to become the first gaming headset to be certified as 'Hi-Res Audio'. In theory this should mean that these drivers are capable of reproducing clear tones throughout its entire range. 'Hi-Res Audio' is generally defined as something that is greater than CD quality, which sits at a bit depth and sample rate of 16 bit / 44.1KHz. Simply moving from 16 bit to 24 bit can have a dramatic effect on output quality, while the sample rate is the number of times a sample is taken per-second when converting the analogue source into digital; more samples results in higher accuracy. As mobile technology and wireless bandwidth increases, audio streaming services are shifting towards improving the audio quality of their services, moving from highly lossy 256kbps compression, to lossless codecs such as FLAC (Free Lossless Audio Codec) or ALAC (Apple Lossless Audio Codec) or the mighty WAV. This too was true for movies and games, up until the Blu-Ray era at least, audio files are often subjected to a hefty compression, reducing their storage requirement to make way for the video and other essential information. Now we are reaching a point where we have the storage space available for higher quality audio. Soon we will likely see games AAA+ title games regularly pushing past that 200GB mark, of which a large proportion of that memory space will be from using Hi-Res Audio. To take advantage of Hi-Res Audio however, there are various factors involved that need to be considered, including: the source data, the digital processing hardware (decode, DSP, and D/A conversion), and the output device (speakers/headphones). For audiophiles, none of this is new, however, to make the transition more understandable for the wider market, a licensed certification has been created by the Japanese Audio Society (JAS) and the Consumer Technology Association (CTA) to help consumers easily identify products capable of 'Hi-Res Audio', and for peace of mind, the ROCCAT Khan Pro fulfils that criteria.